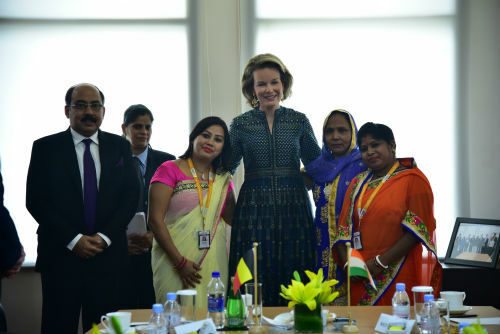 New Delhi: It was an honour for Fusion Microfinance to host the historic visit of Her Majesty, The Queen of the Belgians at their Head Office in New Delhi, India. During her visit, The Queen Mathilde of Belgium showed a keen interest in understanding the work done by Fusion Microfinance and its impact on the lives of its clients. She interacted with some of the vintage clients of Fusion to understand their socio-economic conditions and the effect of the intervention made by Fusion in their lives. The clients shared the success stories of their economic independence and livelihood in association with Fusion. She also met some of the differently abled employee staff. Queen Mathilde of Belgium is on a seven-day state visit to India for the period of 5th – 11th November 2017 on the invitation of the President of India. The visit was also graced with a business delegation comprising of Mr. Max Jadot, CEO & Chairman, Executive Board of BNP Paribas Fortis, Mr. Joris Dierckx, CEO & Country Head of BNP Paribas India, Ms. Linde Verheyden, Director Public Affairs at BNP Paribas Fortis and Mr. Loïc De Cannière, CEO, Incofin. The visit is a testament to the efforts that Fusion Microfinance is making to reach out to the financially unserved and underserved rural women population thereby contributing to the national agenda of financial inclusion.